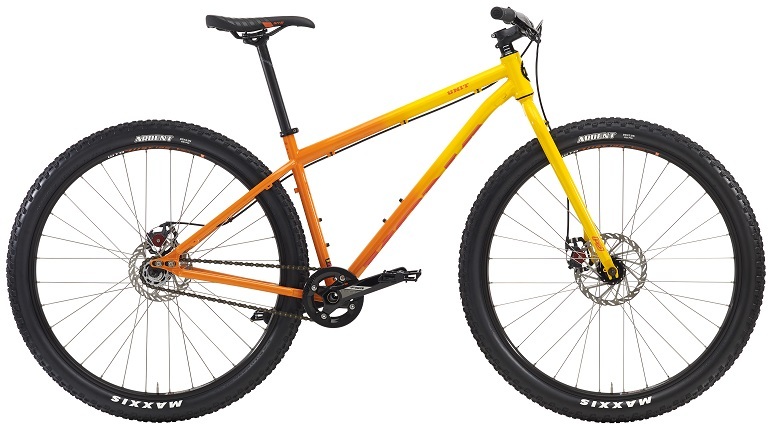 I've been waiting for 2016 Unit announcement pretty much, as well as many other steel-frame-singlespeed lovers. So here it is, with updated geometry and 2 new colors to choose from. Enjoy it or be disappointed with it. Talking about enjoing or being dissapointed, I feel myself closer to the second group. The main thing I was hoping to see on 2016's is longer top tube or at least more fork rake combined with shorter chainstays (cs is the same, at least on the paper) to make the front-center longer without compromising the steering quickness. Keeping the wheelbase close to 2015th model's bounds would leave the bike nimble and playful. Anyway, one can fit a different rigid fork with more rake to qucken the steering response, but that would make the front wheel even lighter (which some folks may find as an improvement). Wheter it's good or bad, 69deg headangle is pretty fresh in the world of rigid bikes. What doesn't look sharp to me at all, is the steeper seattube angle. Lowering the BB looks sharp to me. No complains there. ...Hm, maybe much greater standover (it has become a bit lower by the way - the BB is lower and headtube is shorter now) and bent seattube, following the Honzo steps? Or maybe Unit would loose its personality in that case? And the colors... Well... Unit has had a reputation of a brutal work tool for guys who are tough enough to hit the trails fast with one gear and no suspension. The problem is those guys won't be happy about having pop bright-colored work tools... Or maybe I'm wrong again? Of course, the things that I didn't like are all my problems. All in all, what we have from Kona in 2016 is a pretty extraordinary rigid bike that many will find more trail-capable than the older one. Last edited by Brisk Snail; 07-20-2015 at 12:22 PM. If they were going to offer two paint schemes, I wonder why they went with garish for both of them. After owning several bikes that were pretty dull in appearance, I've been finding myself drawn to color lately, but it still seems like an odd decision by Kona. The older unit(s) had perfect geo. talk to many of the guys at kona and they'll tell you that the unit was the most dialed bike in the line for years. I've ridden/raced the 13' unit a bunch and it is perfect. Slacker ha, longer front end, shorter rear end, meh. Keep on drinkin the koolaid kids. Slacker ha, longer front end, shorter rear end, meh. Keep on drinkin the koolaid kids. I suppose racing daddies don't do drops, don't drift around corners and don't ride tight switchbacks, do they? Ya and we did it with 26" full rigid 71/73 with 40 psi on real trail that wasn't all this modern day "flowy" ghey IMBA dirt sidewalk stuff that's more suited for 25c's at 100psi. We rode trials and did dirt jumping on small-sized XC frames when no special bikes for those purposes had been invented. When bikes for extreme mountain biking hit the market, it appeared it was much more comfortable to do jumps and tricks on them. The same thing here. You can ride whatever you want on a bike with classic geometry, but some things can be done better on bikes, designed for those things. By the way, no one's talking about modern trails. Natural trails all the way. Having shorter front-center, riding through roots and rocks will be much slower. Furthermore, 2013th Unit's geometry is faaar from being conventional, it is one of the examples of new-school long front and short rear end. 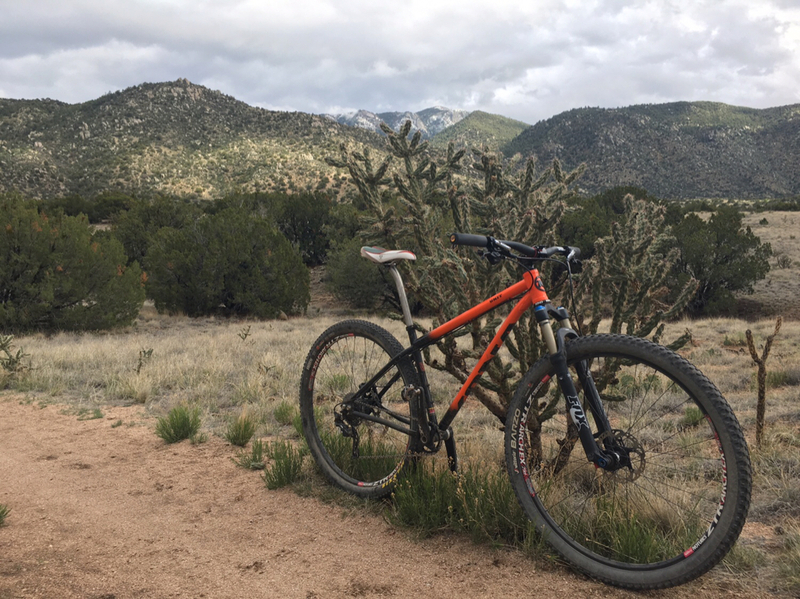 I really enjoy having a classic rigid mountain bike, but since no one limits you with having one bike only, it is also nice to have something for having more fun on rougher trails. And why Unit? Because the Kona makes new-skool (at least they say so) stuff and re-design geometries almost every year. 2016 UNIT's geometry is approaching that of Vassago's Jabberwocky. I like it. I just wish they'd gone to a tapered capable headset back in 2011. Has anyone purchased one of these yet? I really want and unit and finding one in an XL used has been pretty hard. I would really like to get on of these, break it down and paint the frame to my liking because these new color schemes are haggard but then it wouldn't have the factory badges. Anyway, one can fit a different rigid fork with more rake to qucken the steering response, but that would make the front wheel even lighter (which some folks may find as an improvement). Wheter it's good or bad, 69deg headangle is pretty fresh in the world of rigid bikes. If a rider wants to avoid a steep STA b/c it puts too much weight on the bars, what would he want with a slack HTA in the first place? IMO, a slack HT and steep STA go together, along with the shorter head tube, to rotate the rider forward, around the BB. So Kona's new geo makes sense to me...except that applying this geo to a rigid SS doesn't work for me at all. 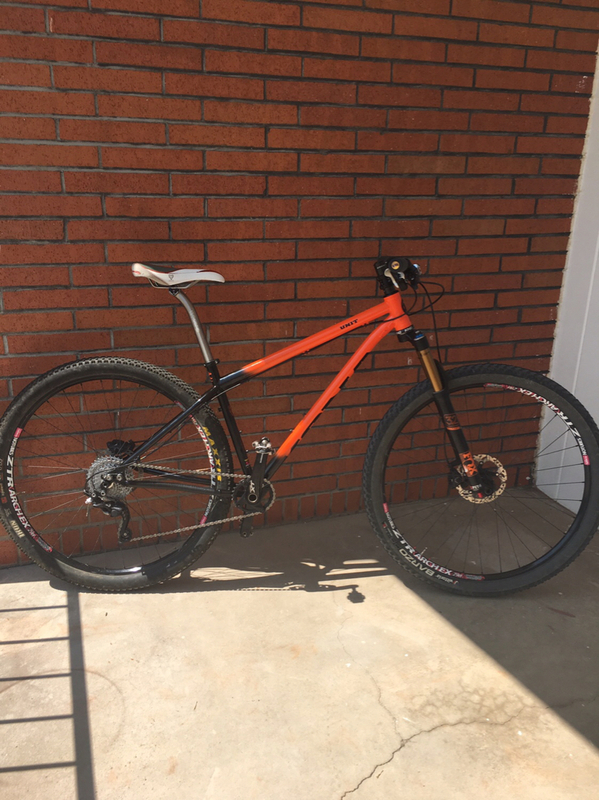 Enduro-style riding on a rigid SS? Little market for that. Has Kona mindlessly applied the new school geometry to a bike that needs to keep one foot in the old school camp? I agree that, on a rigid MTB, a non-steep STA can be an advantage b/c it allows the rider to keep his weight off the bars. On my rocky trails, I find it critical to keep the STA slackish and the bar high (i.e. light front end). Plus, this set-up is magic for standing climbs because you can get nearly vertical and dance on the pedals. But...to keep the front end sufficiently weighted, I don't want a long cockpit or too slack a headtube angle. But that's OK - its a rigid bike - I'm not gonna be bombing technical downhills or hitting big drops anyhow. On those kind of trails, most riders are gonna seek some suspension (that's what the Honzo is for!). Personally, I'd like to see Kona shorten the chainstays a bit so you can run 32/19 and 32/20 at/near the front of the drops without a half link. 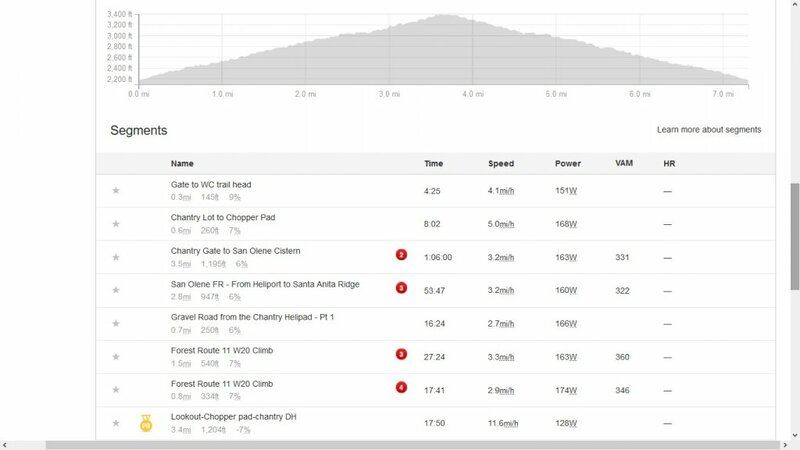 Plus, I think most SS riders simply prefer stays under 17.5. I'm 6'2" and feel anything longer than 17.2 is a buzz kill. The orange/black is an eye sore IMO (worst looking Unit I've ever seen), but I kinda like the orange/yellow (until the fork is replaced anyhow). Good post! I still don't understand the reasoning behind steeper seat-tube angles, because you want your knees above the pedal spindle for any real pedaling. Other than that, this is spot on. you want your knees above the pedal spindle for any real pedaling. As long as your knee, hip and arm/torso angles are good, KOPS doesn't really matter. So how would you define "good" angles? If you like your knees and do a lot of pedaling on flat surfaces, then you want your knees above the spindles. Moving the saddle forward will increase power, especially climbing, but will cause the rider to fatigue quicker and extra stress on the front of the knee. At least that's what I've experienced and read. Anyone try one yet? I just put a deposit for the LBS to bring one in for me to check out. I'm trying the orange/black one, as opposed to the Big Stick popsicle orange/yellow because the Big Stick ones won't be in stock until February. Seat tube angle, to me, is just about the least important geo number. Easily changed with a straight/setback/laid-back seatpost and saddle fore/aft adjustment. I generally pay most attention to ht angle, cs length, bottom bracket drop... And stack-reach for sizing, and to a lesser extent effective top tube. Alright... picked it up yesterday. The color is nice in person. I got the size Small. The LBS swapped the cog with a 22t. The Small came with 170 cranks, so after swapping it with a 175, I also slapped on a set of orange grips and spd pedals. Waiting for a set of hydraulic brakes to arrive to make it complete. Can't wait to try it out next weekend. Congrats. Looks good. And will look even better at night, I'd guess. One thing I like this year is that its the first year ever (I think) the Unit comes with a color-matched fork, making it a more proper frameset (like Niner, Salsa, Surly, etc.). Classier. Holy crap that's a big rear sprocket! The 2011 has a 26t from an old cassette. It's not my bike. The 2016 has a 22t. First ride last weekend. No sustained climbs, but it kicked my rear. I am determined to get stronger... eventually. 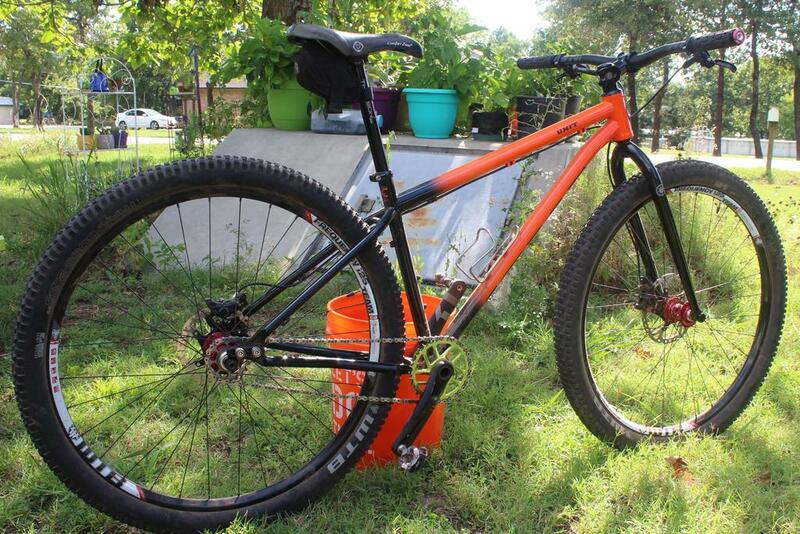 Awesome---I really dig the orange, even more now seeing it in a "real-life" photo than on the Kona site---looks cool! So I've been modding the bike here an there, as parts started coming in. It's weighing in at about 24 lbs now, which is probably lighter than I would like for this kind of bike. Merry Christmas / Happy Holidays to ALL !!! Is it a single speed specific rear hub? No, my 2016 came with a geared freehub and spacers for the single cog. visions come not to polluted eyes. That color is nice. What size is it? I've made a few more upgrades to my Unit (aside from the carbon seatpost, stem, handlebars, XT crankset and SLX hydraulic brakes). I've added a Titanium fork, Reynolds AM 29 wheelset and rear thru-axle sliding dropouts. thinking about getting a Unit frame. I think putting a 120mm fork on it would raise the BB too much though. I like the idea of a versatile frame that can reasonably run a rigid fork or a 120mm squish. somehow I was able to pull that off with my Juice. A Jabberwocky looks like it will do the same though. Putting a 120mm fork would not only raise the BB, it would also add whole 70-75mm of height to the front end (static & in case you'll use EC44 lower cup) which means a good ~3.5deg slacker angles. If a headangle of 65.5 is reasonable, a seatangle of 70.5 will make your ride horrible (in my opinion). I'm also considering to buy a Unit frameset (have been considering since 2013 ), but I think 80-90mm fork with an external headset cup would be the limit in terms of keeping a seattube angle reasonable. I came to hate slack seat angles - they do compromise the ride qualities too much. Take a look at Honzo - it will perform with a 120mm fork much better. If you take a frame up to 2016 MY you can also swap the dropouts to 135x10 if you need to. I did not think of the result from the headset. good call! I might also have totally misread how geometry changes. I could change my fork (tapered steerer) back to 100mm and probably be fine, but I think that might still require an external headset and jack up the front end too much still. what would bethe end geometry with a 100mm 29er RS Reba? I never know what A-C measurement to use; sagged or static? I appreciate that Kona is still making a rigid steel bike that is designed to be a rigid bike! I just need the option for squish at least some of the time to deal with the chunk in central Texas. Last edited by mack_turtle; 06-30-2017 at 06:21 AM. It seem that when your headangle changes for 1 deg, the seatangle will change for the same amount of degrees (unles you will be re-bending main tubes of a frame ). Changing your fork travel to 100mm may sound like a good option! 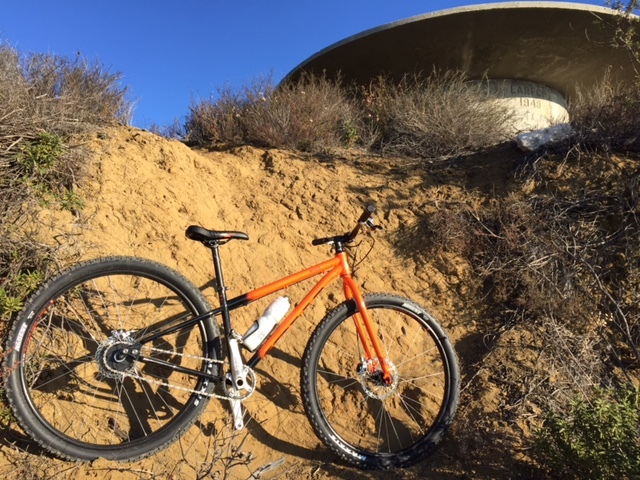 When I want to understand what would geometry be like on a hardtail in real life (especially when you're used to rigid forks), I always try to estimate the geometry numbers with both unsagged fork and 60% sagged fork. Neglecting the unsagged geometry is not a good way to understand behaviour of a bike as on some steep climbs (especially when seated) you will be dealing with a fully (or almost, depending on fork pressure) extended fork. On the other hand, when you will be attacking corners hard, you will most likely be dealing with geometry with 50-70% compressed fork. Counting geometry for 20-30% sag is only good for understanding your pedaling position and steering response on flat and staright runs. I've been running a 100mm fox on my 2016 Unit with no issues. I wouldn't hesitate putting a 120 fork on it. Don't get too lost in the numbers and try it. I've since had the fork rebuilt with a 2017 fit4 damper with awesome results. I wouldn't hesitate putting a 120 fork on it. Don't get too lost in the numbers and try it. looks compelling, but FWIW (and I think this is W a lot), I emailed Kona and they said that putting a fork longer than a 100mm suspension fork would compromise the strength of the frame. unfortunately, these frame ar unvailable at the moment. I picked a bad time to sell my frame. This past January, I discovered a crack in the frame of my 9 year old Vassago. Right after the holidays and looking for a quick replacement that would allow me to utilize as many of the parts as possible from my Vassago, the Unit was one of several frames I was considering. I called Bikeman.com and initially tried to get a 2017 medium frame, but they were sold out. They could get me a 2016, so I pulled the trigger. The tapered seat and chain stays, along with the track end dropouts on my old Vassago frame definitely look much nicer and it is noticeably lighter, but I really like the functionality of the Unit's sliding drop outs and rear tire clearance. The Kona fork that came with the frame looks well made and nicely finished, however being a qr fork, is still in the box. I am using my Salsa CroMoto Grande 15mm fork. Experimented with several different handlebar widths/stem lengths searching for that right feel and currently running a 70mm stem with 740mm bars. Feels pretty good, although I noticed that on real steep climbs, I do not seem to be able to pull as hard on the bars with the shorter stem. Wondering if a 80mm stem would help there or maybe it is just something I have to get used to after previously riding the same setup for so long. 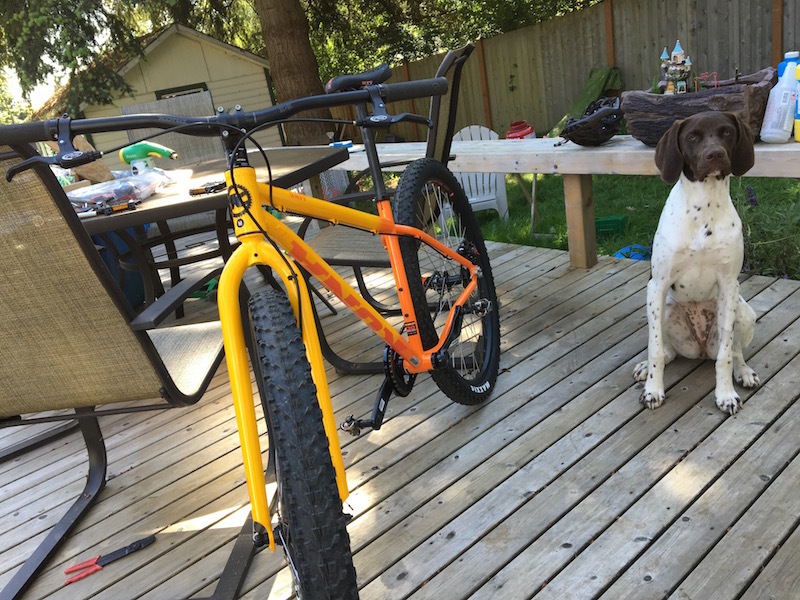 Any thoughts on adding hydraulic brakes to a 2010 Kona Unit?